Some beaches are ideal for young children while others provide the perfect atmosphere for water sports like windsurfing. All the salt water beaches allow one to swim laps, build sand castles, fly kites and just enjoy sitting in the sun. It is worth noting that resident only beaches are available in some of the Cape towns. They are a nice perk for folks that own property on the Cape because they tend not to be as crowded. All beaches should be explored for their individual beauty. We have our favorites. Here they are. By no means are these the only great beaches on Cape Cod. Click here to find the latest beachfront homes for sale in Cape Cod. Register with us to save your favorite listings, custom searches and for email update when new properties match your criteria. Contact us for more information or any question! 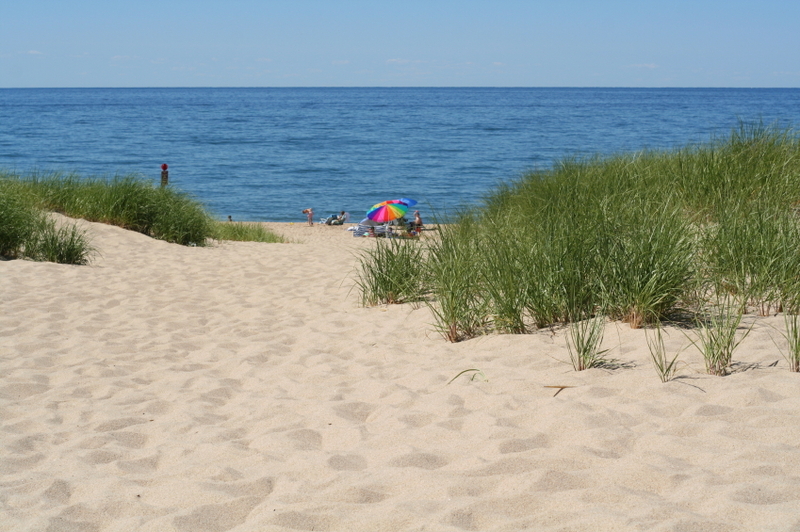 Dennis offers lovely beaches on Nantucket Sound and Cape Cod Bay. There are twelve public beaches. On Nantucket Sound you will find from small and intimate beaches to large and open beaches. West Dennis Beach is a sand spit which stretches over a mile and is one of the most popular mid cape beaches. It features an extra large parking lot, concessions, comfort stations, showers, playground, lifeguards in season, picnic areas and sugary sand as far as the eye can see. Beach conditions are ideal for water sports such as windsurfing, sail boarding, kite boarding, and kite surfing. There are designated areas of the beach for such sports. West Dennis Beach has everything you could want in a beach. It is a great place to take in the views of marsh birds, windsurfers, and weirs that seasonally can be seen. Chapin Memorial Beach is lo cated on Cape Cod Bay. It is popular with 4WD owners because with a special permit they can drive on the beach. At low tide with the flats extending over a mile it is an ideal place for clamming. At low tide fishermen enjoy catching striped bass that are feeding along the marsh grass. The only amenities available at Chapin Beach are portable restrooms. Corporation Beach, located on Cape Cod Bay, is an ideal beach for youngsters. The beach is situated on a small cove protected by a break-water. The water is calm and warm. It's an ideal spot for little ones to search and catch sea life in the pools of water. Amenities include comfort stations, concessions, lifeguards in season, picnic areas and playground. Barnstable consists of six villages offers four public beaches on Nantucket Sound and Cape Cod Bay. Thanks in part to the Kennedy family, the best known village is Hyannis, which offers Veteran's and Kalmus Beaches. Kalmus Beach on Nantucket Sound features warm, calm water. Noted for being the most reliable sailable winds on the east coast, it is ideal for windsurfers with its consistent southwesterly breezes. This is a wonderful spot to spend an afternoon watching acrobatics going on in the water. Amenities include comfort stations, showers, concessions, and lifeguards in season. 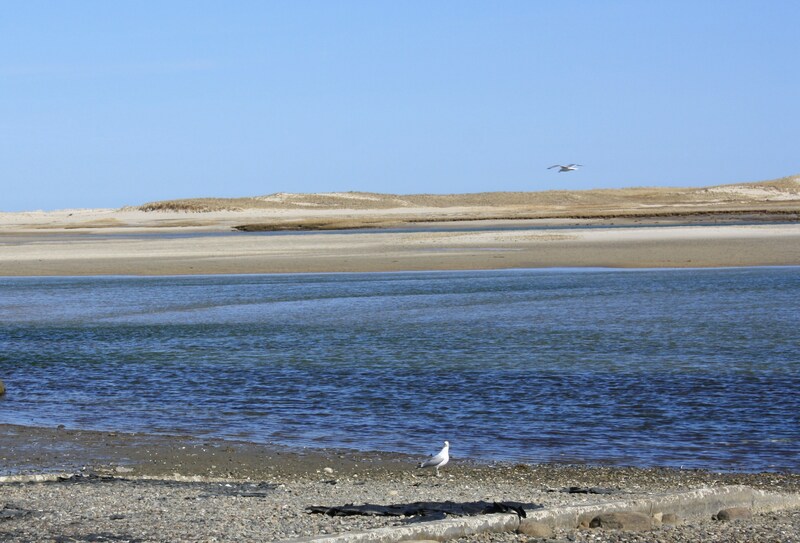 Sandy Neck Beach is a Cape Cod Bay beach with expansive tidal flats at low tide. The beach, six miles long, is one of the longest in the area. 4WD vehicles are allowed on the beach with special permit. There are wonderful walking trails along the marsh allowing for great bird watching. With permission open fires are allowed. Amenities include comfort stations, showers, concessions, and lifeguards in season. Yarmouth offers nine beaches on Nantucket Sound and Cape Cod Bay. Bass Hole Beach also known as Grays Beach, features a wonderful board walk that juts out into the Bay, free parking and ample picnic grounds. The marsh is expansive and a terrific place to watch ospreys in the nests. Amenities include concessions, lifeguards in season, and comfort stations. Bass River Beach, also known as Smugglers Beach, is located at the mouth of the Bass River. It offers sugary sand and calm waters on Nantucket Sound. There is a fishing pier for young and old anglers. A great spot for family gatherings. It offers lifeguards in season, comfort stations, and concessions.